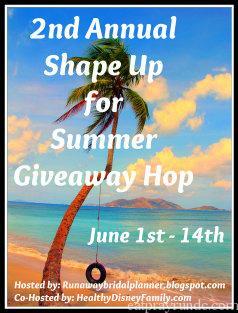 Shape Up for Summer Giveaway - Win an Amazon Gift Card! Hi, y’all! I’ve decided to join in with Kristy at Runaway Bridal Planner and Denise at Healthy Disney Family for their second annual Shape Up for Summer Giveaway! I’m excited to join in with both these ladies and a bunch of other awesome bloggers (see below) and you should be excited because you’ll have to chance to visit all the participating blogs and win prizes! As for me, I’m going to keep it simple and offer up a prize that I’d love to win myself: a $25 Amazon Gift Card. Ideally, you’ll use it to purchase something you need to keep you on your fitness goals this summer but you can also buy toilet paper (no judgment this way). So, how do you win? Easy – check out the entry methods below and remember you can enter every day between now and June 14. June 14th is actually my wedding anniversary (wow, can y’all believe it’s been one year?? I can’t!) so I won’t be announcing the winner until June 15. Check back then and see if you won! Good luck to all of you – now go enter all the fantastic giveaways and win prizes!! I’m an Amazon Prime lover! I use it for everything, it’s so convenient. I love Amazon! Between free 2 day Prime shipping and the new Prime Now app, I can get just about anything I would ever want from them very quickly! Oh this is awesome! I am an amazon prime person because they have so many different items. There is not a lot you cannot find on amazon these days! Love me some Amazon! I’m getting ready to move back to Guam and I know how the island is limited as far as what you can buy so I rely on websites like Amazon to get me what I want/need. We LOVE Amazon Prime – which is a good think b/c I just paid thaat $99 fee for another year! Great giveaway idea! I would love to get some new running gear with this! When I was in grad school I had the free student version of Amazon Prime, but I haven’t found that the annual fee is justified. Maybe I just don’t do enough Amazon shopping! Emily recently posted…Summer Fitness Giveaway Blog Hop! We like the idea of getting Amazon Prime, but just haven’t done it yet. I don’t have Amazon Prime. I always wait until I have $35 of stuff to get free shipping. I’ve thought about trying prime but haven’t done it yet. I like and use Amazon but have not gone with prime yet. Thanks for the giveaway! Nay, I don’t purchase enough from Amazon to make it worth the cost. Don’t get me wrong I love Amazon but most things I do purchase come with free shipping. Amazon Prime all the way! It’s more than paid for itself in saved shipping costs. And I love the 2 day delivery! I do not have Amazon Prime, but we buy Amazon and save by buying over $50 when we shop. YAY I am an Amazon Prime customer. Yes I have Amazon prime and use it every couple of days. I love the fast shipping. I’d like to try Amazon prime. I haven’t yet. I use my husband’s amazon prime acct. I owe my sanity to Amazon prime, I love love love love love love love it!!!! I probably order things 2-3 times per week! I would love to try Amazon Prime out! I am not a prime member. I usually try to order and get the free shipping. I was a Prime member a long time ago but have not re-enroll because it’s no longer free after a trial period for students. I am definitely an Amazon primer and they just announced they will do free same day shipping in LA for purchases over 35 dollars. I can definitely see that coming in handy in the future! I don’t currently have Prime, but I have used the free trial before and I enjoyed it. I may consider getting it in the future. Yes, we are! We got it for the free shipping and the stuff we can watch on TV on it. We have Amazon Prime. I love it! I haven’t tried Amazon Prime yet. I can’t believe it has almost been a year since your wedding! I loved reading your wedding posts! absolutely! I love your blog!! I did a trial of amazon prime once and I feel if I bought more things on amazon it would be worth the price. I love and adore Amazon Prime! 😀 It makes my life so much easier! We are Prime all the way! In the beginning I was not a fan but now I am. Not prime I do use Amazon often. I tried their free trial, which was nice, but don’t use amazon quite enough for it to make sense for me. That being said, I do love amazon! I am not an Amazon Prime kind of person. Love the site but don’t want to pay the annual fee. love Amazon Prime. I thought it was cool they recently announced same delivery in this area. I am an Amazon Prime kinda person. Big yay for Prime. Oh yes,I have Amazon prime. I love my prime…gotta pay my yearly fee this month. I have not joined prime. I dont have amazon prime. I love Amazon so much, I would love to have Amazon Prime but I haven’t made the leap yet. Absolutely since I’m a student! Amazon gift cards are always a great present idea. I really need to get a foam roller before my first full marathon training starts at the end of the month! Nay. I shop Amazon a lot though. I love Amazon Prime, I started using it when I was in college. It’s awesome! Nay. Don’s shop there often enough. I love amazon prime! It’s the best to get free 2 day shipping. I LOVE Amazon Prime. We’ve had it for yeaaars now. We live close to Seattle so two day shipping ends up being one day half the time, which is the best! I love Prime streaming too! I’m just not an Amazon Prime person, ever. I do not see the point of it. I am a Prime member, it has great benefits. My daughter is always shopping on amazon. Who doesn’t like Amazon? Of course, I love it! We’ve had amazon prime for about 5 years, we love it! Nay, I am currently not an Amazon Prime kind of person. I haven’t used prime yet, but I do buy a lot from amazon! Yeah, I do love the benefits of Amazon Prime. Thanks bunches! Amazon Prime is a lifesaver! I was as a student! It’s gotten more expensive since then. I really like Amazon Prime. I love amazon, but I’m too cheap to pay the prime fee. Yes, I am am an Amazon Prime kind of person. no,I do not have amazon prime,although I do love to shop on amazon!! Yes I do! Amazon Prime is a must have for my household. I’m not a Amazon Prime user yet. Been thinking strongly about it. I love Amazing Prime. Awww..this year went by so quickly…congrats to you and K for the almost 1 year mark. Did you decide on your anni trip (I may have missed it….late night brain). No , don’t buy enough from amazon for it to payoff! No. I don’t use Amazon enough for Amazon Prime to be worth purchasing. I have amazon prime and I use it often! Yes, I love Amazon and free shipping is like a birthday present! Amazon Prime is my fave! My mom pays for amazon prime and I was able to connect my email/account to hers! win-win for all of us! I finally got amazon prime last year because I am CONSTANTLY ordering from them! The shipping costs I was paying totally justify the cost of prime! Kaila @healthyhelperblog! recently posted…WIAW: Swanson Vitamins Giveaway! I love Amazon Prime! You can’t beat 2-day free shipping. Otherwise I was buying more stuff to reach the minimum. No, I am not an Amazon Prime kinda person. Amazon prime is fantastic. I love it. Usually turn on to filter prime only too. I love Amazon Prime. We use it all year, but it especially pays off when shopping for Christmas gifts. I’m not a mall person! I am! I love the idea that it ships free and fast. Love the video too! I’d like to be an Amazon Prime member but I can’t afford it. Love Amazon! It’s my favorite. Yay if I could afford it. Mer @ scootadoot recently posted…Navy/Air Force Half Race Entry Giveaway Winner! We currently don’t have Amazon prime but are thinking about getting it back soon. It’s a definite yay on the Amazon Prime. Shipping costs to Alaska were horrible so it pays for itself pretty quickly. Love me Amazon Prime! I order alllll the time! We’ve been Prime members for several years. It is definitely worth it. My hubby buys a lot of stuff through Amazon. I’d have to say nay but I haven’t tried it yet. Yay for shaping up for Summer! It’s going to be a great one! I love the idea of Amazon Prime but I haven’t caved quite yet… I am definitely debating though and all for it! I like Amazon but don’t have one. I still dont have Amazon Prime, but would love to try it out! Yes, I love Amazon Prime and take advantage of its benefits all the time! No, I’m not into prime as I don’t purchase enough on my own to find the value in it. The majority of my buys are for product reviews so I have the codes to cover it all. I am right now and I love it! I am an Amazon prime girl. I am not a prime user. I think Amazon Prime is a great idea but I am not a user. Happy anniversary a few days early! yes but I let my sister pay the fee and the whole family uses it-lol! I’ve always wanted to try Amazon Prime, but I don’t have it. No, I don’t shop there often enough. I just love amazon prime. I use it all the time. I shop on Amazon all the time, but I haven’t tried Prime yet. Nay, I don’t buy often enough and when I do want something sometimes I ask a friend who has Amazon Prime if they will place the order for me. I wish I had Amazon Prime!! I would definitely use it! I am not a amazon prime member. I do however shop on there all the time. I don’t have Amazon Prime, but I wish I did!!! I’m an Amazon lover, but I haven’t signed up for Amazon Prime yet. I love using Prime! Amazon is my favorite place to shop! Such a huge selection! I resisted Prime for a long time but now I love it!!! YAY all the way on Amazon Prime! I love it! Tricia @ A Couple Of dashes recently posted…How to gain a clearer mind and a new perspective. I love Prime. I order at least twice a week from there and have been watching a ton of the prime video shows. Of course now that my cable company has imposed bandwidth limits that isn’t a good thing. No, I don’t use Prime. I just spend enough to get the free shipping deals. I’m not but my boyfriend is trying to decide whether or not to do it. Amanda Jordan recently posted…New Reviews Coming Soon! Well, I visit Amazon almost daily and buy stuff every other week or so. This is a great prize. I love Amazon. You can get almost everything you want there. i cannot survive without amazon prime! I currently do not have Amazon Prime but I am dying to be able to get it!! I love Amazon Prime! It makes it so easy to just pick up little things I need here and there. Early congrats on your wedding anniversary! I don’t know a whole lot about Amazon Prime, but I have shopped Amazon several times. Thanks. I don’t have it, but I want it. Nay! For now, but maybe in the future! Kristin recently posted…Pop Up Camper Remodel: An introduction to my new baby! By the way, I hope you don’t mind when I post this giveaway in my giveaway site? i dont use prime. I do order occasionaly from amazon. they always have stuff i want but i find a lot isnt shipped to canada or i would order more frequently. I keep thinking I should be an Amazon Prime person lol! helly on the run recently posted…Let The Training Begin!! Definitely an Amazon prime person! Love that it gets here so quick! Yes indeed. Been with Amazon Prime for three years. It helps tons with free shipping, free streaming movies and for my love of e-books. I love Amazon Prime. It really saves money in the long run! We tried it for the streaming but we didn’t find much that we enjoyed. I liked the 2 day shipping! I don’t use prime but i love Amazon. No, I do love Amazon I buy mainly eBooks and instant movies for my Kindle. I have never used Amazon Prime but I have shopped at Amazon before. So I guess NAY to Prime. I wish we had Amazon prime. Not in the budget yet. i would like amazon prime but cant afford it!! Yes I love my Amazon Prime! Yes, this is my third year of Prime membership and I love it! The free 2 day shipping and Prime Pantry are awesome! No, I’m not an Amazon Prime person! Nah but we need to start! I have been tempted, but not yet taken the plunge for Amazon Prime. I really should be a Prime member, I buy enough from them through the year:) Great giveaway, thanks for linking up with us! My husband is an amazon prime member and we use it often I would say on average at least once a week. Recently we used it to order a part for our car and the part was delivered quickly! I love Amazon Prime and our family uses it all the time! no, i love shopping on amazon though! I don’t have Amazon Prime, but I do a lot of shopping on Amazon. I do not have Amazon Prime I don’t want to give back my books. No, I don’t pay for the Prime. I am on Amazon monthly, sometimes good buys are found. I do not use Amazon Prime. I have wanted Amazon Prime but no I dont have it yet. Yay on the Amazon Prime! We don’t use Amazon all that often (unless I win or am gifted a GiftCard)…so, we don’t have Amazon Prime. Thanks and God bless! I’ve had Amazon prime for years now! I do but my subscription is about up and cannot renew right now. I have Amazon Prime and I really like it! I use it all the time. I do not have prime. I tried it before but I found I just don’t buy enough throughout the year to justify the cost. Sarah Jestings recently posted…Should I take my kid to a concert? Tips included. I’m not but the hubby is. nay. i dont mind waiting! I think Prime is awesome but I do not order enough to justify the yearly fee.